XENIA — Attendees will once again step back in time this year at the 47th Old Timers Days, Friday-Sunday, Sept. 22-24 at the Greene County Fairgrounds. An annual tradition at the fairgrounds since 1989, the show will kick off at 6 p.m. Thursday, Sept. 21 with opening ceremonies. A king and queen will be crowned, followed by cake and ice cream and a golf cart parade. Admission to Old Timers Days is $4 per person. Children 12 and under get in free with a paying adult. Friday is Senior Day, giving admission to persons over 60 for $1 from 8 a.m. to 5 p.m.
Gates will be open 8 a.m. to 10 p.m. on Friday and Saturday and 8 a.m. to 4 p.m. on Sunday. According to Lester Davis, president of Old Timers Club, the weekend offers attractions for all members of the family while at the same time raising money for the community. “My thing is — and I always say this — help us help you,” Davis said. Old Timers Club uses proceeds from the event to donate to burn units, Christmas funds, and other local organizations and individuals. The weekend’s schedule is packed full of demonstrations, parades, contests and local entertainers taking the stage. Visitors can check out farm equipment, shop in the flea market and eat good food. Special farm machinery this year at the show will include international tractors and fire-related equipment. Two demonstrations will take place on Friday — threshing at 1 p.m. and saw mill at 2 p.m. A hayride will begin at 7 p.m., followed by square dancing with the George Brothers Band at 8 p.m. on the center stage. Saturday begins with pancakes and sausages in the dining hall, served 7-10:30 a.m. The day will also feature the popular antique tractor pull at 9 a.m., a kid-friendly big wheel race at noon, and a parade beginning at 2 p.m. Richard Lynch Band takes the stage at 4 p.m.
New to the show this year, Davis said, is a safety demonstration. In conjunction with nearby county farm bureaus, local fire departments will demonstrate how to rescue a farmer who has fallen into a grain bin and offer other practical safety tips. The demonstration will begin at 10:30 a.m. on Saturday. Attendees can start Sunday with a 9 a.m. church service and watch the garden tractor pull at 11 a.m. Kids can partake in the bubble gum blowing contest at 11:30 a.m., pie eating contest at noon, and the kiddie tractor pull at 1:30 p.m.
Lumber from the saw mill demonstrations will be auctioned off at 3 p.m. Sunday. The golf cart and quilt raffle will end the weekend at 4 p.m. on center stage — this year featuring a 2012 golf cart. Camping is available at the grounds during the three-day show for $10 per day. The grounds will be available beginning 8 a.m. Monday, Sept. 18. The camping spaces are first come- first served. For a complete schedule of events and entertainment schedule, visit www.oldtimersclub.com. Find The Old Timers Club on Facebook for additional information. Plenty of kid-friendly activities are set for the weekend, including a big wheel race, pie eating contest and bubble gum blowing contest. https://www.fairborndailyherald.com/wp-content/uploads/sites/50/2017/09/web1_BubbleGum.jpgPlenty of kid-friendly activities are set for the weekend, including a big wheel race, pie eating contest and bubble gum blowing contest. File photos Visitors can watch farm machinery in operation, check out equipment demonstrations, and cheer on tractor pull competitors at Old Timers Days, held Friday-Sunday, Sept. 22-24 at the fairgrounds. 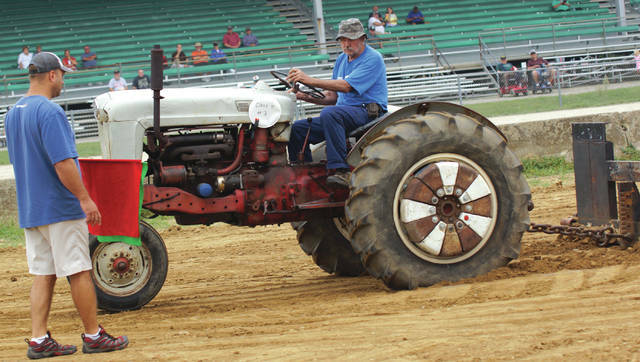 https://www.fairborndailyherald.com/wp-content/uploads/sites/50/2017/09/web1_OldTimers1.jpgFile photos Visitors can watch farm machinery in operation, check out equipment demonstrations, and cheer on tractor pull competitors at Old Timers Days, held Friday-Sunday, Sept. 22-24 at the fairgrounds.